Here is the step by step guide to Tehri Recipe in UP (Uttar Pradesh) style. Tehri as it is called is more famous among the people of Uttar Pradesh and Bihar. Is it famous in other state too? Please drop a comment with a state’s name and I’ll surely add it here. Call it with different names or spellings, like Tahri or Tehari, but the taste is same. Put 1 tsp of desi ghee on Tehri and have it with any pickle, if possible mango pickle. I don’t know how much this is true – only a Kashmiri friend would tell me – Wikipedia says Tehri is a street food there. 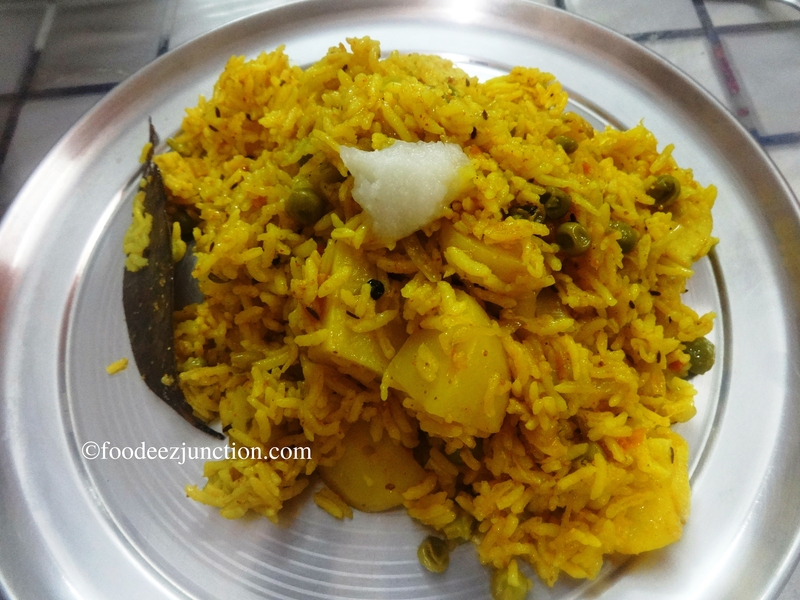 Tehri is yellow rice cuisine with potatoes in it. The main ingredients are potatoes, rice and haldi or turmeric powder. I, usually, make it in a pressure cooker. But if you don’t have a pressure cooker either you can get one from the below given link of Amazon or you can make it in a pan. Making Tehri in a pan will consume more time. Pour oil in a pressure cooker and put it on high flame. Once the oil is hot, add shahjeera, laung, tejpatta, kali mirch, javitri, ajwain and dalchini. After 20 seconds of frying them, add onion slices and saute till golden. Add ginger-garlic paste and saute for 20 seconds. Be careful, it will splutter. Now add tomatoes. After 1 minute, lower the flame and fry the masala. Cook till the oil separates. Now add haldi powder, garam masala powder, salt, green chillies and kashmiri mirch powder. Fry for around a minute. Add potatoes and stir fry it for 2 minutes. Now add curd. Mix well. Add green peas, stir again. Now add rice, four cups of water and lemon juice. Close the lid of the pressure cooker and turn the gas stove’s flame to high. Leave it for 3 whistles. After 15 minutes, open the pressure cooker, stir the rice carefully. Tehri is ready to be served. Serve it in the plates. Put some desi ghee over it and have it with khatta aam ka achar or any other tangy pickle. 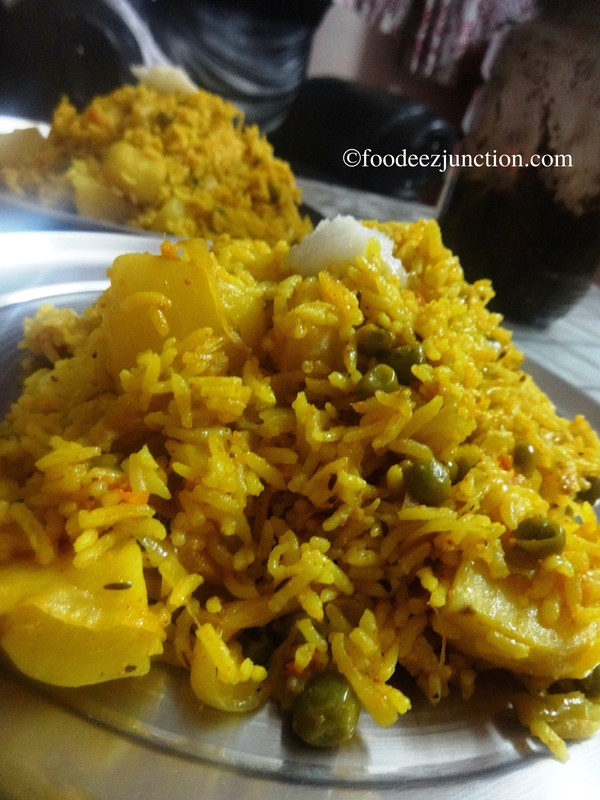 If you liked the Tehri recipe, write to me on foodeezjunction@gmail.com or simply drop a comment. I’ll love to hear from you. Thankuhh sara for postng this tasty recipe of teheri….i really like this dish when i make it at my home…. Hey Sharad, Thank you. I’m glad that you liked the tehri recipe. I’ll post the matar paneer recipe and the sweet milk at the earliest. Hey Shilpa, yes ajwain is carrom seed. Even you can make it today:) and let me know how it was. I’m glad you liked it. Enjoy Cooking and have a great day ahead!